Popped into Vodafone Cambridge this morning to find they have just taken delivery of the new Treo750V . 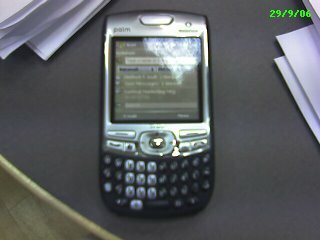 (Picture is of their dummy phone taken with my Treo650). It will be released this Sunday, 1st October, but they refused to release pricing details. Looks and feels really sleek, slightly smaller and Nick will especially like the lack of an aerial, although I alwys found it handy for tugging the phone out of your pocket. It presents me with a real dilemma as in some ways the windows OS might be better, especially since most digital maps used with GPS are only available for Windows 🙁 It might also integrate better with Outlook etc). However, Eatwatch and OnlyMe only run on Palm and I suspect lots of the other nifty apps, dictionaries, Metromaps etc may not be available on Windows. It also uses mini SD cards so My Tom Tom software will be obsolete unless I can do an exchange somehow. Just received my replacement Treo650 for the one I smashed (see the cute bulge) when I fell over catching the bus in Nice (Please don’t laugh having walked 350 miles over rough terrain – couldn’t hack a walk to the bus!). Will be interesting to see what I do…. Here’s Fiona McLean doing her bit for the worlds biggest coffee morning here in Cambridge. 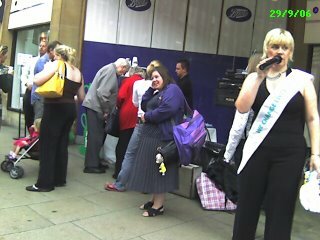 Free coffee is provided by The CSL group with Macmillan nurses collecting if you want to make a donation.